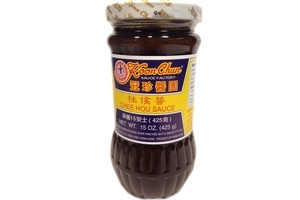 Koon Chun Sauce Factory Chee Hou Sauce in 15oz (425g) jar. Chee Hau also known as chu hou paste. Popular dark brown Chinese braising sauce made from soybeans, garlic, and ginger. Product of Hong Kong. water, soya bean, salt & wheat flour, rice vinegar, salted garlic (garlic, salt). Yuen Chun Thick Caramel Sauce (Naturally Fermented) - 25.3fl oz. Telephone Agar Agar Powder - 0.88 oz. Thick Caramel Sauce (Naturally Fermented) - 25.3fl oz. Hot Chili Sauce (Triple Spice in Chili Oil Sauce) - 9.88 oz.